The gentle sorting mechanism results in improved viability of cells and higher outgrowth. Reduced stress during a sort also avoids potential gene expression or karyotype changes experienced with traditional sorters. Disposable microfluidic cartridge, no biohazardous aerosol exposure, no sample to sample contamination. The WOLF uses a small fraction of the sheath used by traditional sorters, allowing users to use growth media as sheath. Using growth media as sheath greatly improves cell viability. The 5 parameters of the WOLF and N1 provide higher rates of singlet detection compared to cell printers or limiting dilution. Designed from a user’s perspective, the software interface is easy-to-use while featuring powerful analytical features. Step-by-step guides help users get from sample to sorted cells quickly. The robust, portable, sterile, and safe system can be used in any lab without the need for dedicated hoods, venting, or personnel. Light enough to be moved and shared. A module for the WOLF Cell Sorter to sort and dispense into 96-well or 384-well plates. Applications requiring the sorting and dispensing of single cells, such as B-cell identification in antibody discovery, and monoclonal CHO cell line development, are now easier with the N1® Single Cell Dispenser. Additionally, single-cell ‘omics assays, where sample preparation is a key step for quality data generation, no longer have to be heroic academic exercises when employing this WOLF® accessory. Users can select the same cell population for every well, or assign two different cell populations. Each well of a 96- or 384-well plate can receive anywhere from 1 to 100 cells as they are sorted from the sample. Or users can simply dispense from a pure population. The N1 Single Cell Dispenser is seamlessly integrated into the intuitive software. Select single-cell from the dropdown menu, map out your plate, and hit go. 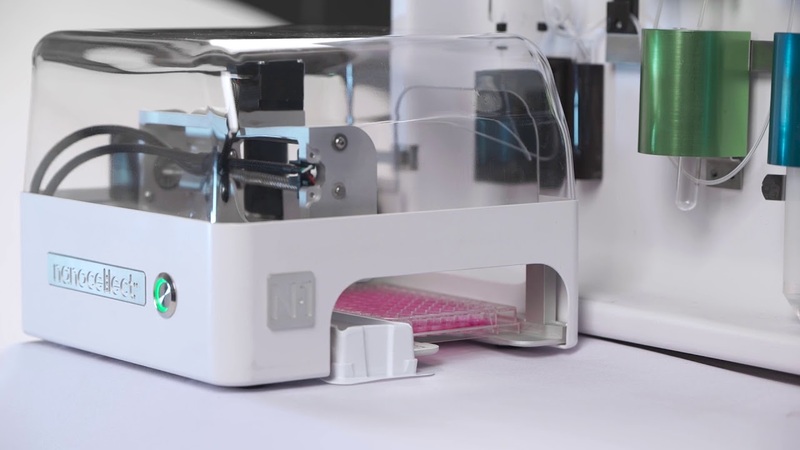 The WOLF and dispenser work together to deliver plated cells in a compact and affordable format. After sorting, data from each cell is indexed well-by-well, allowing for confirmation of the plated cell.